EUPHORIA. Ann Ellsworth, horn. Ray Anderson, trombone; Lew Soloff, trumpet; Mat Fieldes, bass; Marianne Gythfeldt, clarinet and bass clarinet; Sabina Thatcher, viola; Rachel Drehmann, horn; Jo-Ann Sternberg, clarinet; Debra Shufelt-Dine, viola. No label. Claudio Monteverdi, arr. Kenneth Cooper—Zephiro torna; Peter Maxwell Davies, arr. Ann Ellsworth—Selections from “The Yellow Cake Review”: Yesnaby Ground, As Earthquakes Subsided, Uranium’s Daughter’s Dance, The Pacemaker, Farewell to Stromness; Gene Pritsker—Still Unvanquished for Alphorn and Samplestra; Daniel Schnyder, arr. Ann Ellsworth—Selections from “Euphoria”: Miraculum Divinum, Bananas, Fuga, Dance of Joy. EUPHORIA is a labor of love. This truly unique and delightful recording was made by Ann Ellsworth, a veritable renaissance woman of the horn, in celebration of her Mother’s 80thbirthday. The pieces were chosen as a programmatic walk through of her Mother’s life, and they are an unusual and eclectic mix of tunes, performed by a who’s who of some of the greatest musicians, both jazz and classical, working in New York today. The recording opens with an arrangement of Monteverdi’s “Zefiro torna”, a madrigal originally for two tenor voices, based on an ode to Zephyr, the west wind that brings Spring and its attendant opportunities for romance, or at least dalliance. Kenneth Cooper’s arrangement highlights the subtle, buoyant character of the music, allowing the tenor voices, performed with great beauty and effortlessness by Ellsworth and Rachel Drehmann, to soar in a optimistic song of Spring. Next comes Ellsworth innovative arrangement of selections from Maxwell Davies’ “The Yellow Cake Review”, composed in 1980. In the aftermath of the publication of a report concerning the possibility of mining uranium (‘yellow cake’) which had been discovered near the town of Stromness in Orkney, the total opposition by the local community persuaded the Secretary of State to reject the mining proposals. The pieces are structured as cabaret songs, and in Ellsworths’ arrangement, rather than having sung dialogue, the extraordinarily talented Ray Anderson and Lew Soloff improvise in lieu of text. Gene Pritsker’s Still Unvanquised for Alphorn and Samplestra combines brilliantly the ancient soul-tugging sonorities of the alphorn with Samplestra, pre-recorded electronics. Ellsworth’s ease on the Alphorn is evident, as she plays expressive lines with a clear, beautiful tone throughout the extensive range for which the piece is written. The final works on the recording, also arranged by Ellsworth, are selections from EUPHORIA, originally written for saxophone and brass quintet. The piece is a narrative of the biblical story of Abraham, Sarah and Hagar. Ellsworth has rescored four of the seven movements, highlighting all of her incredible collaborative artists in surprising and innovative combinations. This CD is simply a joy to listen to, as it is a testament to Ann Ellsworth’s strengths as visionary artist, horn player, arranger and collaborative musician. Late Night Thoughts. 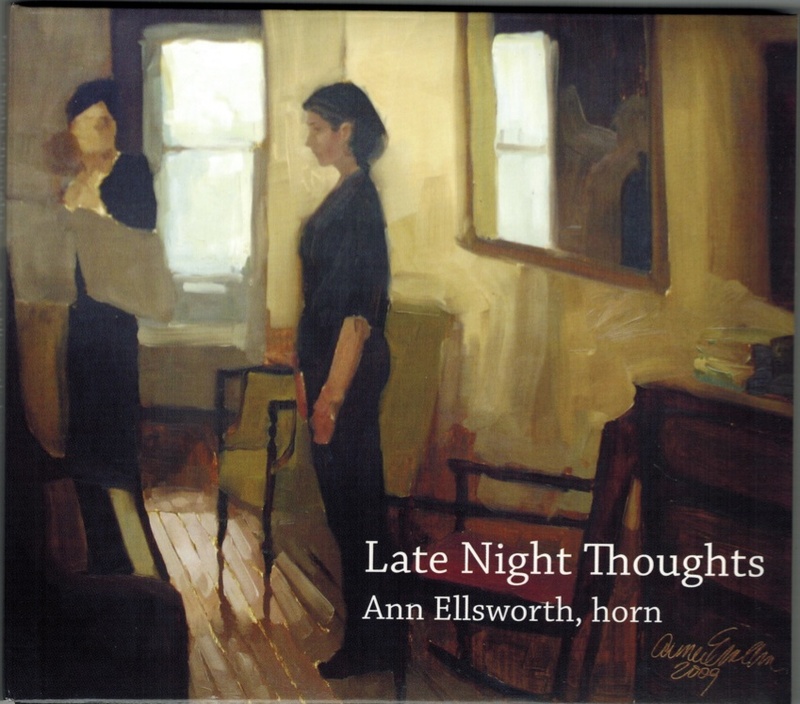 Ann Ellsworth, horn. Keve Wilson, oboe; Kenneth Cooper, harpsichord; Ellen Hwangbo, piano; Daniel Khalikov, Kristi Heiberg, violin; Irena Momchilava, viola; Peter Weizner, bass; Drew Santini, baritone. No label. Claude Debussy: Sonata No. 4 for oboe, horn and harpsichord, reconstructed by Kenneth Cooper (2001); Arvo Pärt: Spiegel im Spiegel, Johann Joachim Quantz, Concerto in E[musical flat], Perry Goldstein, Late Night Thoughts from the V.A. 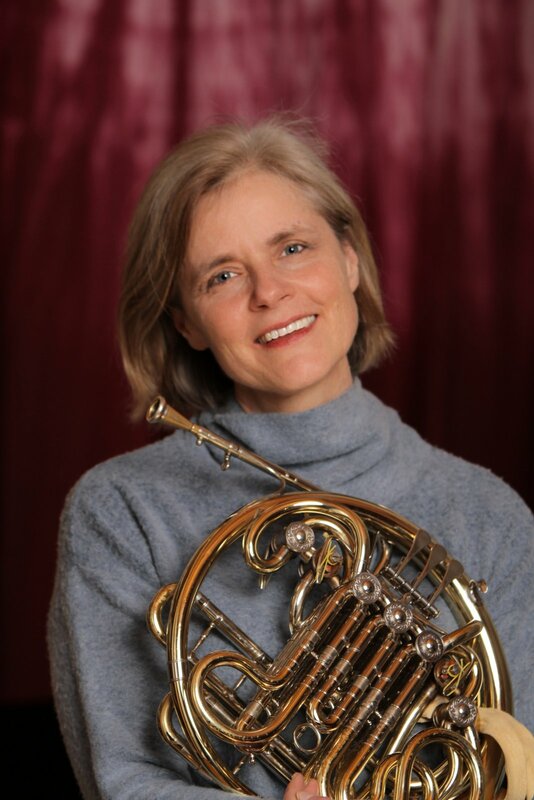 Ann Ellsworth, New York area free-lance hornist has recorded a beautiful collection of interesting works for horn (or arranged for horn). Throughout the CD, Ellsworth’s playing is stunning – light, facile, warm and lush; she and her colleagues bring this varied collection of music to incredible light. The world-premiere recording of a reconstruction of Claude Debussy’s Sonata No. 4 for oboe, horn, and piano has moments of contemplation, childlike playfulness, and shimmering ecstasy. Kenneth Cooper, harpsichordist, writes in the liner notes that Debussy had conceived of writing six sonatas for diverse instruments, but sadly didn’t live long enough to complete his vision. At the end of the third sonata for violin, Debussy handwrote, “The fourth will be for oboe, horn and harpsichord.” Cooper’s edition (International Music Company, 2011) draws melodic material from Debussy’s pantomime ballet, La Boîte á Joujoux, a 1915 piano scherzo, Pour les notes répétées, and his first set of Images (1905). The piece is a delightful work, and while we can never know exactly what Debussy might have composed for this group of instruments, this reworking of other works by Debussy makes for an excellent piece of music that audiences will no doubt love to hear, and musicians will love to play. 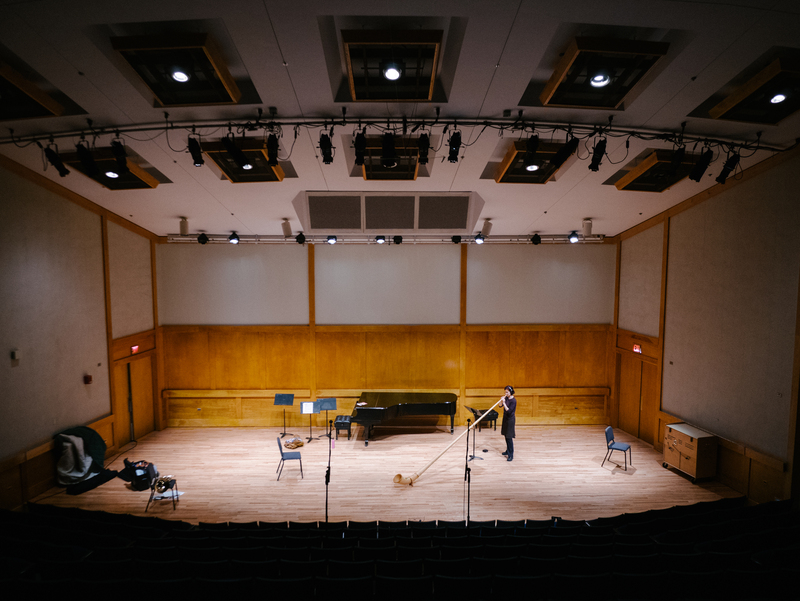 On this recording, all three musicians react beautifully to one another, with Keve Wilson’s oboe playing a gorgeous counterpoint to Ellsworth’s clear, resonant horn sound. Avro Pärt’s Spiegel im Spiegel, originally written for violin, works beautifully for horn (recorded previously by David Lee). Pärt writes in a style that he refers to as “tintinnabular,” exploring the complexity of overtones existing within a single sound, unraveling the patterns of harmonics implicit in the sound itself. The beauty of the music is in its simplicity, and it resonates in a deeply emotional, if not spiritual place in the listener. In Quantz’ Concerto in E[musical flat] major for Corno concertato, Oboe, Strings and Harpsichord [c. 1740s? ], Ellsworth performs bravely in the baroque clarion style, demonstrating her strength, range, facility, and style. Improvisation was expected of concerto soloists in the era, and Ellsworth effectively improvises certain elements in the final movement, according to the liner notes. Perry Goldstein writes extensive liner notes about Late Night Thoughts from the V.A., composed in 2008. The poems by celebrated poet Richard Power convey the thoughts of a protagonist on his deathbed in the veterans’ hospital at 8 pm, 10 pm, 3 am, and 3:10 am. They dwell in uncertainty, pain, and terror, and the composer states that he attempted to match the mood of the poetry with a setting that is “simple, tender, wistful, and, I hope, consoling.” Drew Santini’s baritone is rich, nuanced, and perfectly suited to the depth of this work. This CD has great musical variety, profundity, and truly excellent horn playing. Brava, Ann Ellsworth! The opening act gave this unrepentant rock aficionado chills.I arrived to find a slender woman holding an eight-foot Alpine horn in a boxing ring. As lights dimmed, Ann Ellsworth embarked on a haunting debut performance of something called Still Unvanquished: Her wooden horn followed a score by composer (and ISC co-founder) Gene Pritsker to contend with a composition of electronically charged samples of a track she had previously recorded for him. The result wasn’t as complicated as it sounds. Meticulously planned and executed, the piece was as fresh and exalted as Alpine air.